The island of Chiloé in southern Chile is not a place that promotes itself very aggressively in the world, but it is quietly proud of having given the entire world the potato. History traditionally holds that potatoes were first domesticated around 10,000 years ago in southern Peru and Bolivia, where they were first encountered by the Spaniards and brought to Europe, but recent genetic studies have shown that over 90% of the potatoes around the world today are actually descended from specific varieties indigenous to Chiloé, far to the south. And, as Chilotes (Chiloé’s inhabitants) will tell you, the island is home to well over 400 different varieties of potato. 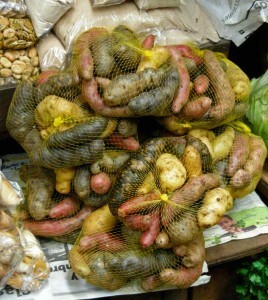 The amazing variety of native potatoes was noted by Charles Darwin, who called on Chiloé in 1834. Chiloé – the main island or Isla Grande, commonly referred to just as Chiloé – and the rest of its archipelago are a kind of Spanish-speaking Hebrides, distinct from the rest of Chile and known for a quirky culture that’s a distinct blend of indigenous and Hispanic traditions. It’s a very green, moist place, covered in thick, boggy forest, fields and yellow gorse, which was introduced to southern Chile by German immigrants at the end of the 19th century as hedges and windbreaks and took to local conditions so well it’s become something of a plague. It rains a lot, and can also be fiercely windy. On the inland, continental side of the main island the tides go out for hours, leaving great expanses of marsh and mud. Chilote towns have a remote, windswept, appeal, and the historic capital of Castro with its palafitos or traditional houses built on poles around the shoreline seems to have become slightly trendy recently, with boutique palafito b&bs and positively genteel restaurants and cafés. Chilotes certainly eat a lot of potatoes, as many as any famously potato-obsessed European country, but all those 400 native varieties seem harder to locate. Many restaurants offer papas nativas or papas chilotas, native potatoes, but generally only of one kind, dark-purplish-black outside and purplish inside, with a tougher consistency and slightly stronger flavour than standard potato types. Having asked about all the other Chilote varieties, I was told I could find them at the Feria Campesina, Castro’s no-frills general-food-and-much-else market, at its busiest on Sundays (in Chile, a general market is usually a feria, not a mercado, which is often understood to mean a craft market). The señoras who run the veg stalls around the market, however, again divide their stock only two ways, between what they called papas normales (bog-standard international varieties) and others all vaguely referred to and sold as papas nativas. Even so, it was clear that most of the bags of native potatoes had many more than one kind in them, so any experienced potatologist (?) could have a great time identifying them. The relative scarcity of the indigenous potatoes of Chiloé (and other parts of southern Chile) and the lack of any marketing structure or process around them is due like so many things to the patterns of modern agriculture. For over 30 years farmers have been encouraged to plant ‘normal’ varieties to gain access to modern urban and international markets. The market for papas nativas is purely local, and they’ve never raised high prices. Chiloé probably needs a potato heritage centre and museum, and a determined campaign to proclaim the virtues of and make the most of the island’s most historic natural asset. As a start, they could set about making clear which native potato is which, and introduce the kind of precise identification used re traditional foods in Europe. After all, the French, for example, give very different and revered names to cheeses that are far more similar than the different tubers that are all stuck into the same papas nativas bags in Castro. The shortage of many of Chiloé’s famous potatoes doesn’t mean that Castro’s feria is in any way disappointing. This is one of the greatest food markets you could ever find in a small town. 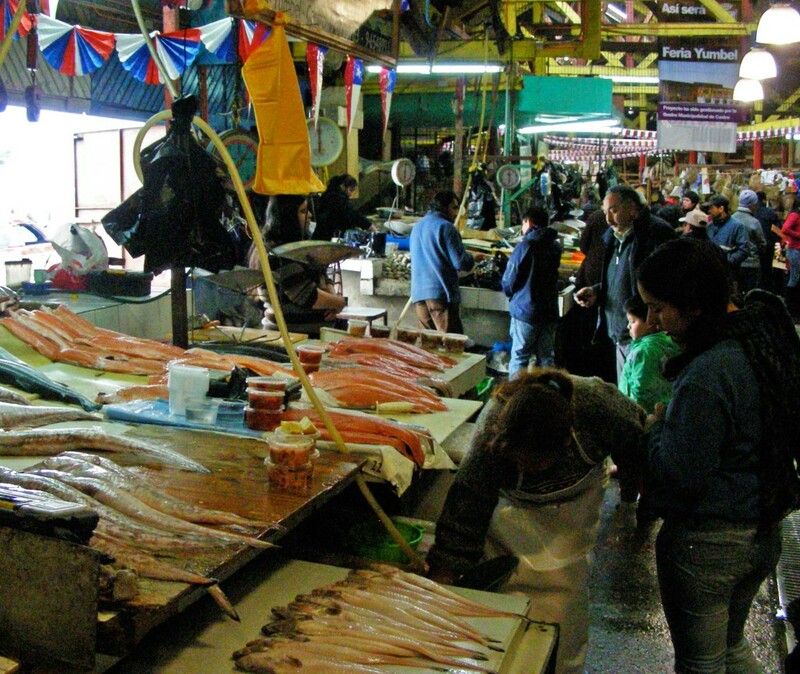 This area’s other major product is salmon, and the fish stalls are stunning. 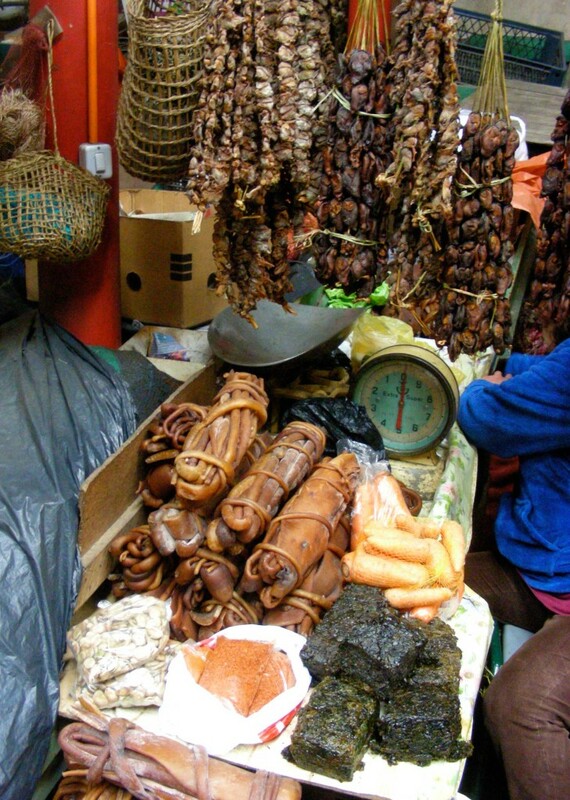 The range of apples, other fruit and vegetables, including giant garlic, is explosive, but Chiloé is also a great place for people who like to eat unusual. The same ladies who sell potatoes also have eye-catching displays of many varieties of… seaweed (algas). There are great bunches of brown cochayuyo, or bull kelp, and green cakes of an inshore weed called luche. The long strands that look like dried peppers I was led to believe were also dried red algae (though I’ve since been informed, by Eileen Smith, below, that they’re actually a dried rock-dwelling sea animal called a piure, another strange local delicacy). When I ask how you eat all these things, I’m told ‘you cut them up, and boil them, very simply, and add them with different things… you eat them with meat, fish, whatever you like… They’re very good, muy sanos, very healthy’. Seaweed is an old traditional foodstuff of southern Chile, and especially Chiloé, but one that has never yet found it into fashionable cooking (despite a lot of scientific evidence backing up the idea that it is, indeed, very healthy) and so it has remained a food of the poor. One traditional Chilote dish is cazuela de cordero con luche, a stew of lamb, luche, potatoes (naturally), peas and maybe other good things too. Lamb and seaweed could be the next international fusion dish to hit the world’s tables. But, if it does, Chilotes deserve the credit. Strings of dried piure, bunches of dried cochayuyo kelp and luche (bottom right) at Castro’s Feria. I love Chile and have been numerous times. This article sent me right back to the island and my memories of the cool and wet day when I visited Chiloe. Chile promotes a lot of things really well ( like the Churches of Chiloe for example), but their cuisine isn’t one of them, which I think is a shame. While it is simplistic a lot of the time, it is good and honest food that stays true to its roots. I love the fact that many of their foods actually still have seasons- i.e. you can’t get strawberries in the middle of winter like in N. America- and therefore have so much more flavour. Great photos too! Thank you so much for your comment, very glad you like the post. The odd thing about Chiloé is that things are partly ‘promoted’ (any number of people will tell you ‘do you know, we have over 400 kinds of potatoes’) but then when you say ‘ok, show me them’, they say ‘I dunno, maybe if you try the market..’ where, as I said in the post, all the native varieties are jumbled up together. If this were France or Italy, they would all have been lovingly catalogued and given elaborate names, and maybe there would even be a regulatory council for each one (imagine!). And the seaweed-cuisine of Chiloé goes almost totally unknown. This makes it of course a very authentic ‘traditional cuisine’, but I think a little more awareness, care and that-word promotion would do it good, if only because, as I was also told, for so long farmers there were told to stop planting native potatoes because only international varieties would sell. Hello Nick, interesting narrative to me on account of both the fact that I was unaware you explored or wrote about this part of the world – meaning the Americas in the widest sense – and also because I myself recently was delving into a huge new book on the topic of Latin American foods and interviewing the author (will tweet you up on that one when it’s all online;)) As far as the extensive potato family itself goes, however, I think the sheer variety provides a fine basis for comparison and looking at the history of what got introduced into this continent from others. My own favorite remains the sweet potato, or yam, but that’s based more on primal ties going back to childhood rather than having any culinary expertise in the potato family – which I really don’t have – and perhaps the lowly sweet potato is considered a poorer cousin of the classic potato? But I leave that one to you, and meanwhile enjoyed your blog. Thanks for your comment. Yes, I write about the Americas, usually more about Mexico than Chile, and hope to be in the Yucatán in a few weeks for the end of the world (ha ha) on 21 December 2012. It’s true, the enormous variety of potatoes and how they got from one place to another is obviously an area about which we could all know a hell of a lot more. It’s particularly vague to me how, if 90% of the world’s potatoes originated on Chiloé, they got all the way up to Virginia in time for Walter Raleigh to find them (if that ever happened). Could be a very fat book, and a big adventure to research with lots of hefty meals. Can you send the print without the background?? When I visited Bolivia a few ears ago I learned that there were 300 kinds of potatoes there. Do you mean (for example) as a Word document? I can certainly do that. And does this mean you want to use it on AOL? Bolivia has its potatoes, but on Chiloé the DNA studies showing the place is the origin of 90% of global potatoes have got everybody (just a little) excited. Very enjoyable article and informative. I see clear text on a white background, BTW. The story of how food from the Americas spread around the world intrigues me. Amazing, isn’t it, that we associate the potato with Ireland and Germany, and the tomato with Italy. Number 4 on the list of corn exporters is Ukraine, followed by India and South Africa (http://www.indexmundi.com/agriculture/?commodity=corn&graph=exports). Thanks for your comments and pleased you like the post. As far as I can see, a really comprehensive potato-history, keeping up with recent discoveries like the ones about Chiloé, hasn’t yet been written. There are a few nice books out about it, but they still leave a lot of things unanswered. What I particularly find hard to understand is how, if potato cultivation began in Chile-Peru-Bolivia, it made its way to North America almost passing by Mexico, where as far as I know potatoes played scarcely any part in traditional food until the Spaniards introduced them from the south. And I took the background off completely so the blog should be easy to read now. I wanted to keep it and have been trying to get the theme designer to tell me how to stop the occasional problems, but in the meantime this seems the simplest solution. Well done. You made the island and the potato a very iinteresting read. Maybe I’m a little too naiive (or stupid) but does the Cassava fit in there somewhere in the South American diet, and is it related in any way? Yes, cassava is also from South America, but more from Brazil and hotter tropical places than the Andean side. From Brazil the Portuguese as I understand it took it to Africa, where it’s become a universal food – so in the same way people think of potatoes as archetypically European, cassava is often seen as African. It isn’t big in the Andean diet today (especially not in Chile) but I think they still eat a lot of it in Brazil, Venezuela, Colombia and some other places. In the English-speaking Caribbean I think it’s usually called manioc. The items you described as strung together like peppers are not a kind of seaweed, but rather a dried red sea squirt or piure (in Spanish), pyura in English (http://en.wikipedia.org/wiki/Pyura_chilensis). I’ve spent 8 years in Chile, and I’ve only eaten a piure once. And if you’d eaten one, you wouldn’t blame me, either. Glad you liked Chiloé though, and so pleased to see photos of something other than palafitos for once. Thanks for your comment, Eileen. I was misled by the proverbial amiable vagueness of market traders, who waved hands and referred to everything as algas. About the cassava. My wife is from Sao Paulo and the Brazilians refer to it as manioc (pronounced Man-jhock), or sometimes as yucca.